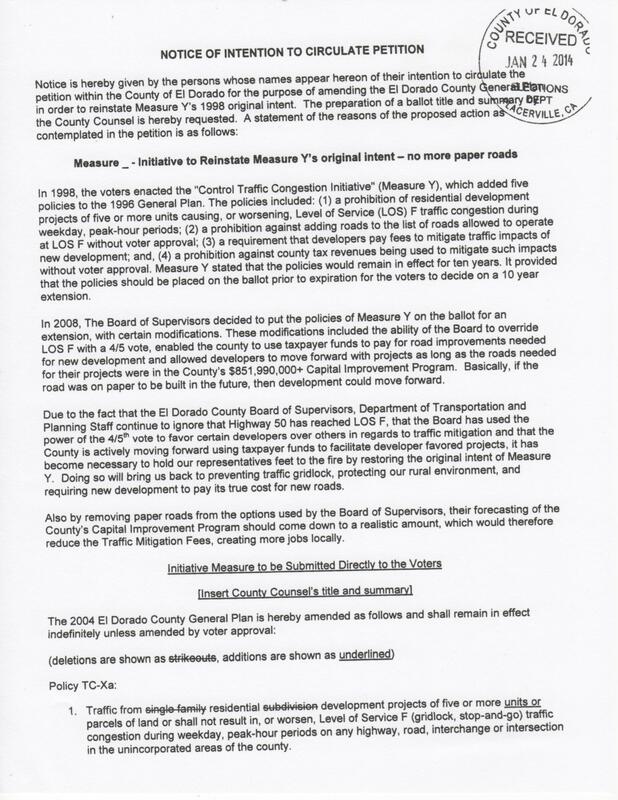 In 1998, the voters enacted the “Control Traffic Congestion Initiative” (Measure Y), which added five policies to the 1996 General Plan. The policies included: (1) a prohibition of residential development projects of five or more units causing, or worsening, Level of Service (LOS) F traffic congestion during weekday, peak-hour periods; (2) a prohibition against adding roads to the list of roads allowed to operate at LOS F without voter approval; (3) a requirement that developers pay fees to mitigate traffic impacts of new development; and, (4) a prohibition against county tax revenues being used to mitigate such impacts without voter approval. Measure Y stated that the policies would remain in effect for ten years. It provided that the policies should be placed on the ballot prior to expiration for the voters to decide on a 10 year extension. In 2008, The Board of Supervisors decided to put the policies of Measure Y on the ballot for an extension, with certain modifications. 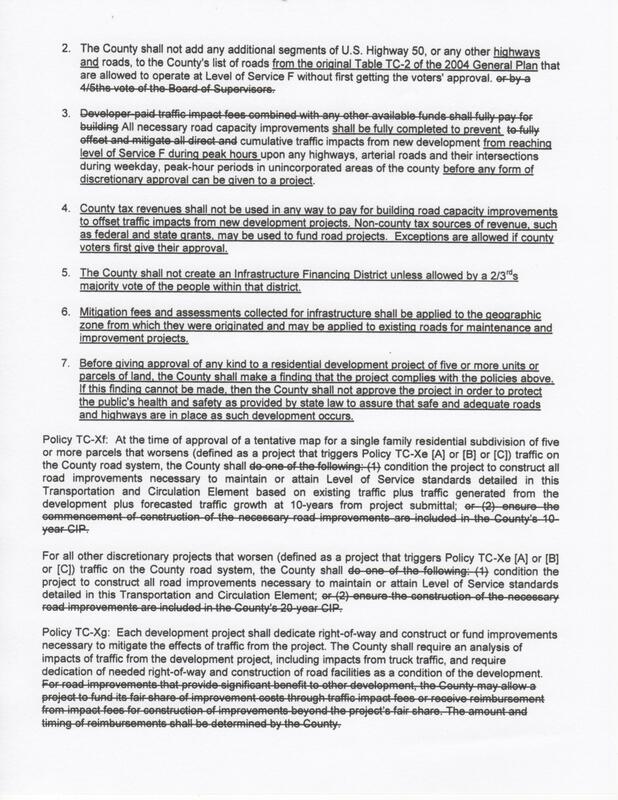 These modifications included the ability of the Board to override LOS F with a 4/5 vote, enabled the county to use taxpayer funds to pay for road improvements needed for new development and allowed developers to move forward with projects as long as the roads needed for their projects were in the County’s $851,990,000+ Capital Improvement Program. Basically, if the road was on paper to be built in the future, then development could move forward. 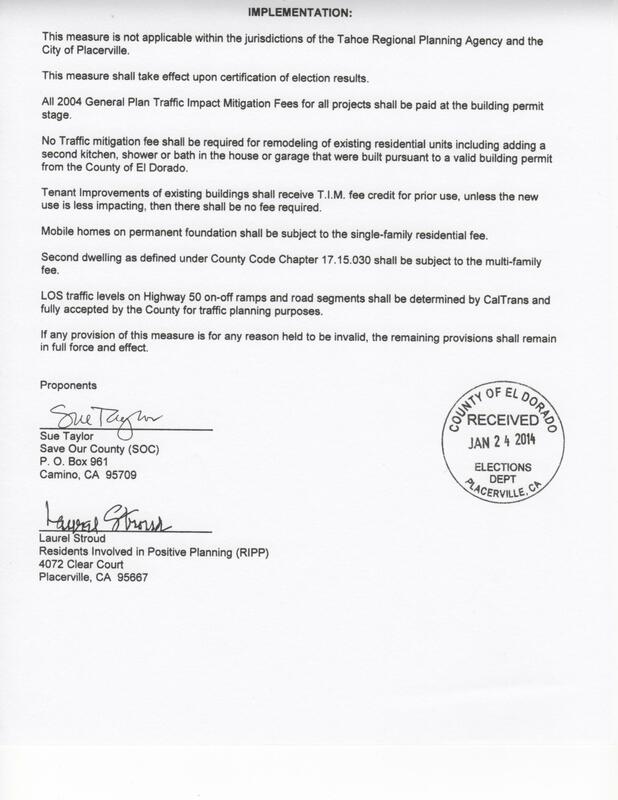 Due to the fact that the El Dorado County Board of Supervisors, Department of Transportation and Planning Staff continue to ignore that Highway 50 has reached LOS F, that the Board has used the power of the 4/5th vote to favor certain developers over others in regards to traffic mitigation and that the County is actively moving forward using taxpayer funds to facilitate developer favored projects, it has become necessary to hold our representatives feet to the fire by restoring the original intent of Measure Y. Doing so will bring us back to preventing traffic gridlock, protecting our rural environment, and requiring new development to pay its true cost for new roads. Also by removing paper roads from the options used by the Board of Supervisors, their forecasting of the County’s Capital Improvement Program should come down to a realistic amount, which would therefore reduce the Traffic Mitigation Fees, creating more jobs locally.